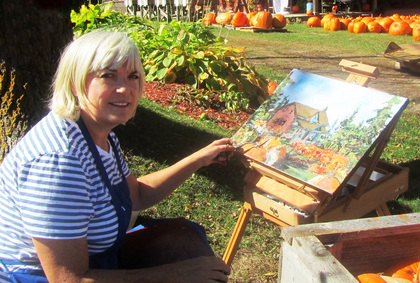 Debra has exhibited her award winning art in many galleries and juried shows including the Homer Watson Gallery, the Wellington County Museum & Archives and the Waterloo Community Arts Centre. She is part of a group show at the Homer Watson Gallery in the fall of 2015. I paint and draw people, scenes, and interiors, but, for me, the subject matter is secondary to how light affects the subject matter and the interesting shadows and shapes it creates. I love shadows! I always use a palette knife because I enjoy the texture it creates in the paint. The knife helps me get to the “essence” of the subject and not get caught up in the details. When I draw, I’m not interested in outside lines but, again, in the light or the values. If I succeed in getting these, then I’ve created recognizable objects. Sometimes it’s a surprise to me to see what happens right before my eyes!